This is a very special memorabilia piece in honour of our very own wonderhorse, Phar Lap. The piece is made up of a replica of a very old picture, published many years ago of Phar Lap, his much admired strapper Tommy Woodcock and his pony. 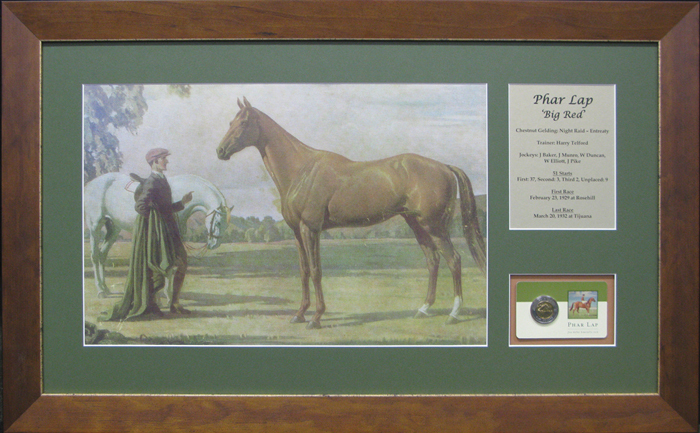 Beautifully framed, the picture is accompanied by a mint condition commemorative Pharlap $5.00 coin and a plaque of Big Red s incredible career record.